In 1999, the Jewish Renaissance Foundation (JRF) acquired two landmark properties comprising 6,000 m2 (60,000 s.f.) due to their unique historic value in having survived the near-total destruction of Warsaw during WWII. JRF's goal was to develop a 5-star boutique hotel as a part of an ambitious effort to restore the historic Belle Epoch elegance of this street. Amber Real Estate conducted market analyses, created a financial model, prepared an Information Memorandum and carried out a tender for potential joint-venture development partners. Eventually 3 competing proposals were presented to JRF in the form of letters of intent. JRF selected Warimpex, an Austrian firm with a long track record in hospitality development in Poland. The transaction closed in 2005 after resolution of complex legal issues related to the long-term lease (perpetual usufruct) of the properties. Funding has been set aside to preserve important landmark elements within each building while adapting them for modern commercial uses. 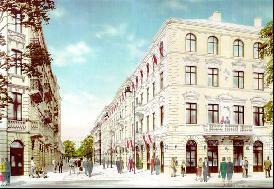 The facades of the adjacent structures will also be restored to maintain the character of the original street.